Preparing for your next camping adventure? Choose the stainless steel Tapirus Spork of Steel Classic Set and you'll have a fork/spoon combo tough enough to eat the bear you think you'll wrestle, the imaginary fish that people at work think you caught, and all the canned beans you'll actually eat! Crafted for the modern outdoorsman, this 4-piece set of sporks is great for everyday indoor or outdoor use, won't fall to pieces or bend if you drop it on the ground, and is a compact set of utensils great for a prepper bag, survival pack, or even a picnic basket. 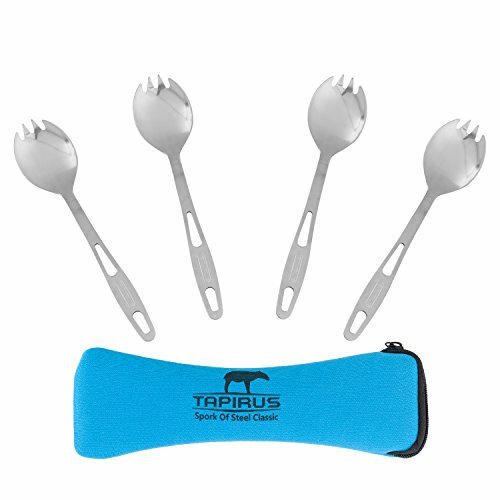 Don't settle for a plastic fork, spoon or knife; get the high-quality and durable Tapirus Spork of Steel Classic Set and you'll save money and reduce all the extra kitchen utensils you need in your pack. Your family and your buddies will all be a lot happier when you were the one smartest to bring utensils for the food. Click 'Add to Cart' now and save the day. COMPACT, STACKABLE - A 4-piece set, this fancy spoon-fork combo utensil set stacks together for easy, light weight, travel convenience. A great addition to your mess kit, survival gear or prepper supplies. ADVENTURE READY - Trekking through Europe? Love hunting or camping? Going on a fishing trip? Reduce your load; carry a spork. Perfect for both adults and kids. DISHWASHER SAFE - Stainless steel sporks are tough enough for the great outdoors and the dishwasher, and they are also far more eco friendly than the plastic disposable alternatives. If you have any questions about this product by Tapirus, contact us by completing and submitting the form below. If you are looking for a specif part number, please include it with your message.